Duration: 3 hours of total tour time. Description: Seaplane only access to Alaska’s famous Taku Glacier Lodge combines classic powerful aircraft, true wilderness, 5 massive glaciers, bears, vivid history with dog sledding roots, seafood and exclusive glacier view dining! 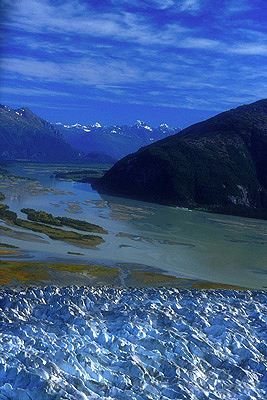 A classic deHavilland seaplane ascends over 5 breathtaking glaciers within the Juneau Icefield, surrounded by the lush Tongass National Forest. Seeing glaciers from the air is an Alaskan MUST DO, and doing so by Alaskan bush plane is the quintessential Alaskan experience! Land on the Taku River at the elegantly rustic historic Taku Lodge, built in 1923 and located across from the 5 mile wide Taku Glacier, Juneau’s largest glacier. Savor a menu of Fresh Wild Alaska King Salmon, chicken alternative, and scrumptious side dishes, all made from scratch. The feast attracts visitors, but also wild black bears. All participants enjoy a window seat and headset for continuous narration. You can do it all in this exceptional combination tour of Alaska’s premier attractions!